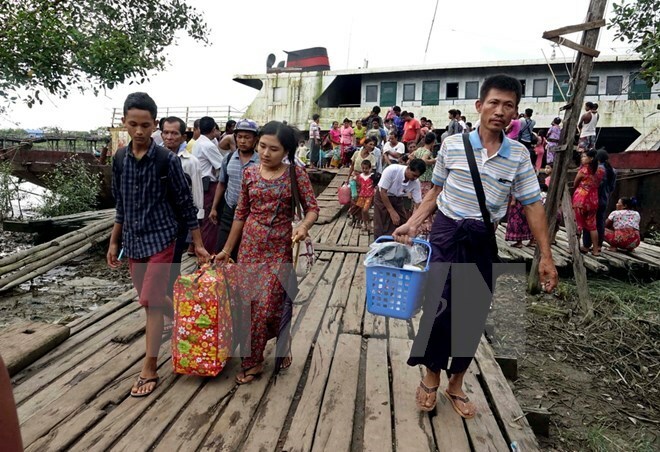 Hanoi (VNA) – Myanmar authorities on August 29 called on all ethnic groups to cooperate with the government to restore peace and stability in Rakhine after at least 110 people have been killed in clashes in the northwestern state since August 25. Speaking to the press in Nay Pyi Taw, National Security Adviser U Thaung Tun said the government has every right to defend itself, and forces will be used with restraint to avoid civilian causalities. He warned that the current round of violence in the area was significantly different from previous attacks, while affirming Myanmar is committed to fighting terrorism, he reiterated. Myanmar’s Minister for Home Affairs Lt Gen Kyaw Swe said that extreme terrorists are trying to establish an Islamic territory in Mangtaw and Buthidaung areas. According to another military officer, if the situation is getting worse, the National Defence and Security Council will hold an emergency meeting to discuss the turmoil. The militants have burned down more than 2,300 houses during the attacks.